Maureen Roe, an MFA guard for 30 years, picketed on Saturday. Amid mounting concern over safety in public spaces, museums face a complicated set of tasks: the need to be inviting and open while also securing their collections and ensuring visitor safety. That’s the backdrop for a conflict that recently spilled into the streets in Boston: During labor negotiations, Museum of Fine Arts guards have taken to picketing to protest changes that would redefine their jobs and could, they say, force some to stop working at the museum. A union that represents roughly 95 of the museum’s guards says MFA leadership wants to usher in a new, more aggressive training model for guards, along with a less-flexible work schedule and reduced raises. In an e-mail interview, MFA public relations director Karen Frascona confirmed that the museum is seeking to enhance its guard training and security operations. Kirchner, who formerly served as director of security at the Harvard Art Museums, said museum security is further complicated by the somewhat circumscribed role of security guards. “You have many museums that don’t even want to call them guards because they want to soften the environment,” he said. He added that unlike police officers, who can apprehend suspects and enforce laws, museum security must focus instead on customer service and conflict resolution. Henderson, the union president, maintained that under the MFA’s proposed plan, the museum would reduce the number of gallery guards and depend more on security technologies. “They’re going to be relying heavily on camera surveillance, taking the guard responsibilities away from protecting the art, and taking away visitor interactions from the guards, which is basically the reason why we all got this job,” said Henderson, contending that this would diminish the visitor experience. Frascona rejected the notion that the museum planned to reduce the number of gallery guards. “At this time, we are not contemplating a reduction in the number of guards, including in the galleries,” said Frascona. 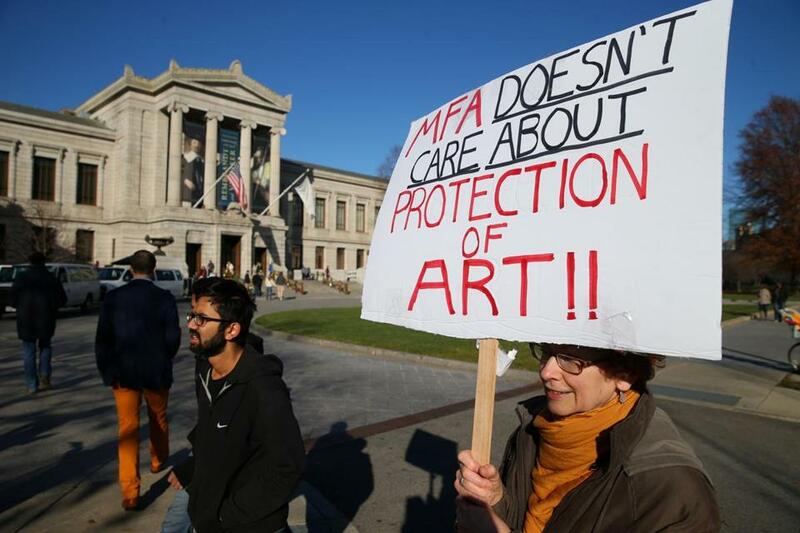 Frascona declined to describe details of the MFA’s security system, citing its sensitive nature. But according to Steve Keller, a museum security consultant with Architect’s Security Group in Florida, the MFA is in the forefront of a broader trend among museums to adopt technologically advanced security systems. Keller, who said he was briefed on the MFA’s security system at a conference this year at the Smithsonian, said the museum uses a predictive video monitoring system that incorporates ceiling-mounted cameras and video analytics to sound an alarm before a person actually touches an artwork. Keller added that the MFA’s system “goes beyond what most museums do,” enabling the museum to conduct statistical analyses of audience movement patterns to determine which artworks (and even which areas of an artwork) are vulnerable to damage, and how they might better be displayed. Among the guards’ other grievances are scheduling concerns. Currently, guards can work shifts of varying lengths. Frascona said the museum was working to standardize the guards’ schedules, creating regular day, evening, and overnight shifts, starting Jan. 3. Under the guards’ contract, the museum retains the right to alter the guards’ schedules independent of negotiations. Michael Raysson, a retired guard who founded the union and remains active in the protest, said the proposed scheduling changes would make work at the museum impossible for many long-time guards. Frascona said the MFA and union are still discussing the schedule changes. “In whatever course we follow, we will continue to be mindful of the needs and welfare of our staff,” she said. Still, Henderson, who said he was considering filing a complaint with the National Labor Relations Board, was not swayed.